MM's Kitchen Bites: Chinese style Eggplant in Sweet and Spicy Sauce...Trimurti!! 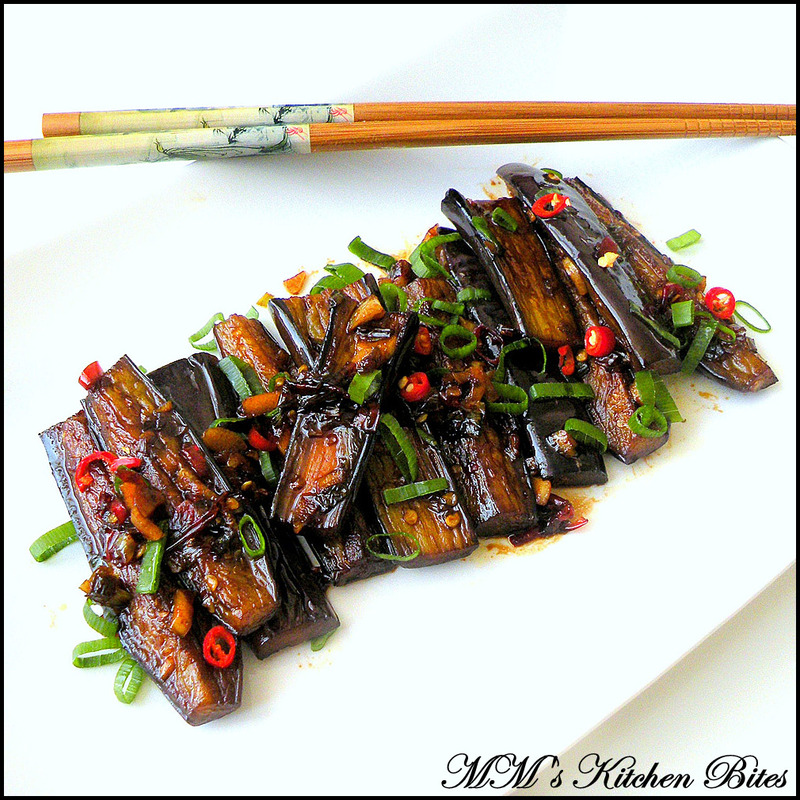 Chinese style Eggplant in Sweet and Spicy Sauce...Trimurti!! If using the large round eggplant, sprinkle the batons with salt, mix well and leave to drain in a colander for about half an hour. Heat a wok or a large pan over high heat. I prefer using a large pan as so that I can cook eggplants in a single layer without tossing around too much. If using a wok or a smaller pan you may have to fry in batches. Once the pan is hot, pour in 2 tbsp oil and swirl around to coat the base. Drop in the eggplants and fry for about two minutes on each side – till eggplant is nice and golden and soft without losing its shape – don’t stir or toss around too much. Remove the eggplants and keep aside. When the garlic starts to change colour, add in the spring onions (keep a few greens aside for garnishing later). Sauté for a couple of minutes and add in the Shaoxing rice wine, vinegar, soy sauce and honey/sugar. Mix well and add in the eggplant. Toss around and let the sauce coat the eggplant well. Serve immediately topped with the spring onions and red chilies kept aside. Add in minced ginger along with the garlic. Skip the honey though it gives a nice glaze and balances the flavor. Use shallots instead of spring onions. Skip the vinegar and Shaoxing wine and use 1 tbsp chili bean paste or black bean paste. Make it saucier by adding some veg or chicken broth along with 1 tsp of corn starch mixed with 1 tbsp of cold water. Add these along with the rest of the sauces. Once everything comes to a boil and the mix thickens up, add in the fried eggplant. These look amazing. I have gone off eggplant recently but I am thinking I need to get back on board and try this out. That glaze looks delicious.